Getting older doesn't mean you have to sacrifice your independence. You can live in your St. Louis, Missouri home more independently with a walk-in bathtub, easy-entry shower, or a Lifetime shower installed by your local St. Louis 3 Day Kitchen & Bath dealer. We will help you remodel your existing bathroom with all of the stylish features and comfort accessories that you desire without sacrificing style or quality. If your needs are more immediate, then don't hesitate to call us. 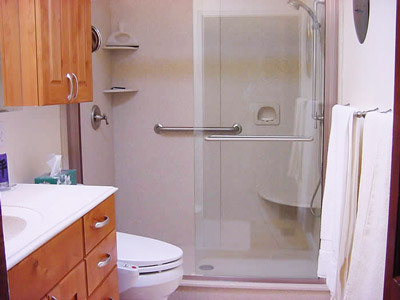 We can remodel your entire bathroom, or simply create an easy-access shower or tub. If you don't foresee major mobility problems, you can still prepare wisely for the future without sacrificing style or beauty. Remove your old tub and install an easy-entry shower with a by-pass shower door. 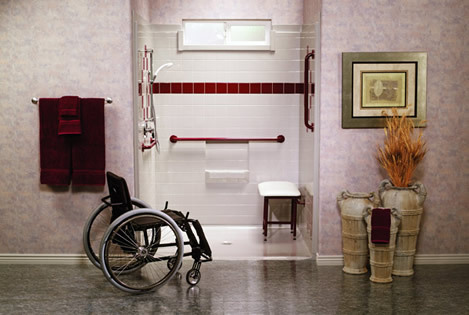 Include grab bars in the shower. An updated, taller vanity cabinet will provide more convenient storage space, and you won't have to stoop down to brush your teeth. "Thanks for the great work you did last week. This bathroom has made a big difference in my life. My life is easier, and my mother's life is easier, too." - Roberta A. 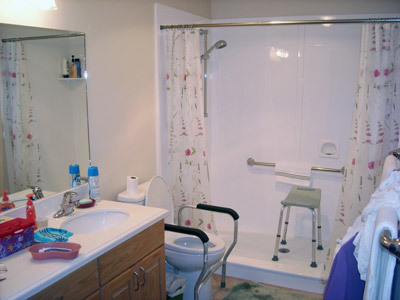 The spacious shower is easily accessible, and has a hand-held shower wand and movable chair so that the caregiver can assist without getting all wet. Heat lamps make it more comfortable, and grab bars in the shower and towel racks provide convenient support. 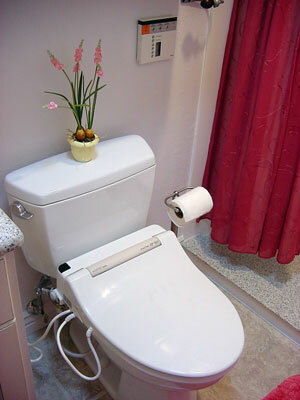 The comfort height toilet, with its sturdy handle bars, provides a sense of security. A new warm-water bidet, with a self-drying function, can add dignity to your loved one's daily life. And the convenient, wall-mounted control allows you to control everything from a distance. Best of all, this bidet cleans itself after every use. If you are caring for a loved one, this wonderful fixture helps both of you maintain your dignity under difficult circumstances. Our Lifetime Shower System allows you to stylishly remodel your bathroom today, and still be prepared for an uncertain future. 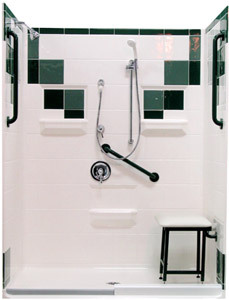 This No-Barrier Shower has a temporary threshold that will support a shower door. At a later date, you can easily remove the door and threshold, and replace it with a heavy curtain for more convenient, barrier-free access. An ordinary shower head, combined with a hand-held shower wand makes this a great shower for everyone. Grab bars and a sturdily anchored padded seat assure stability. As you can see below, once the threshold is removed the entire shower is accessible without barriers. If there is nothing you love more than a warm therapeutic bath, then why deny yourself? Our walk-in tubs allow you to enjoy the benefits of water or air massage without lifting yourself in and out of a tub. Just step inside and close the door behind you! These tubs can be installed in the same space your old bathtub now occupies. 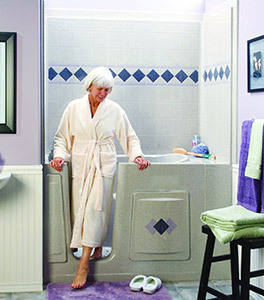 We can install the tub alone, or remodel the entire room if you desire.